Your bedroom is an oasis, a place for relaxation and rejuvenation after a long day. It’s easy to turn your bedroom into a serene retreat by using a few easy and inexpensive decorating tips. Painting and carpeting can be costly and time consuming, but there are still ways to create a fresh, new, and inviting look. There are two main areas to focus on in the bedroom when decorating: the bed itself and the accessories used throughout the room. Since the bed is the main focal point of the room, this is a great place to start when creating a new look. Accessories also provide a way to customize your bedroom on a budget. 1) Use a plain comforter or duvet and dress it up with a variety of throw pillows and shams. Microfleece blankets are wonderfully soft and cozy and make a great coverlet. 2) Coordinating pillow shams and bedskirts help to create a polished and elegant look. If you are handy at sewing, you can make shams and a bedskirt from a long curtain panel which can then match your window curtains for a fraction of the price of buying them finished. Curtains can also be easily made from other fabric you may have or from flat bed sheets. 3) Decorative pillows placed on the bed or in a chair, adds a charming touch. Look for pillows that are on sale or make them yourself from inexpensive fabric. A variety of sizes, colors, and textures help to bring interest and color to a bedroom. 4) Placing a coordinating throw across the bottom of the bed adds a touch of coziness and can help pull all the colors in the room together. It’s also nice to have a throw handy when you want to curl up and read or watch TV. 5) Take a look at your bedroom accessories and choose a few things to change or add. For example, you can purchase a new lamp or even repaint an existing one. Sometimes by simply replacing a lamp shade (whether purchasing a new one or crafting your own) your lamp will look brand new. 6) Wall art is also a quick décor change that’s easy on the wallet. Take an existing frame and put some pretty scrapbook paper inside. Paint or decoupage a wooden sign or stretched canvas for a new piece to hang on the wall. 7) Choose a piece of furniture (perhaps from a garage sale) and make some changes to it. Paint it a fresh new color or just add some pretty new knobs or pulls to make it look unique. It is possible to create a warm and welcoming bedroom with just a little bit of time, money, and creativity. Think about the colors, patterns, and styles that make you happy and then begin your adventure. Soon your bedroom can be cozy, comfortable, and a place you are thrilled to call your own. Most of all, have fun, relax and enjoy your finished project! Linen is considered a vegetable fiber – a natural fiber that comes from the flax plant. It’s an excellent fabric for garments, table linens and bed sheets, but since linen is an expensive fabric to manufacture, its use is limited. Linen is one of the oldest woven fabrics in human history and was once considered suitable only for royalty. Purple linen was the material used in king’s robes – purple being the color representing royalty and linen, a finer quality lightweight fabric. This quality has made it popular in hot climates for thousands of years. Today most flax planets used for fabric is grown in Western Europe and the fabric is manufactured there as well. 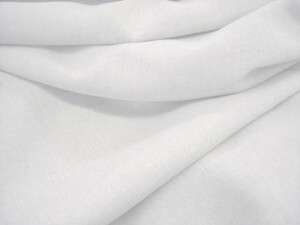 Good quality linen is soft and free of “slubs” – the small knots that can be felt within the weave. Slubs are only found in lesser quality linen. Linen fabric is an ideal choice for clothing and bed sheets because it is durable and wicks moisture away from the skin, however, the down side is that it wrinkles easily. Not only is linen prone to wrinkling, but it is more difficult to iron than other fabrics. In order to eliminate the wrinkles, you must either use a steam iron or spritz the fabric with water. I can remember as a child, my grandmother dampening her linen towels, rolling them into the shape of a log and then placing them in the refrigerator to keep them moist, removing them one by one for ironing. It seemed as though she ironed for hours, but apparently it was worth it to have fresh, crisp, and beautifully ironed linens. When I was grown and started keeping a house of my own, I was given a linen dish towel. It was very absorbent and perfect for drying dishes, but it wrinkled terribly. I have to admit that I didn’t have the time or interest to stand and iron it as my grandmother surely would have done. If you love the coolness, luster, and strength of linen fabric, and don’t mind the extra work involved to keep it looking fresh and crisp, then linen is a perfect choice of fabric for you.